The centre of the North Island is about as far away from the sea as you can get in New Zealand, however adventure still awaits those who also enjoy mountains as well as the sea! 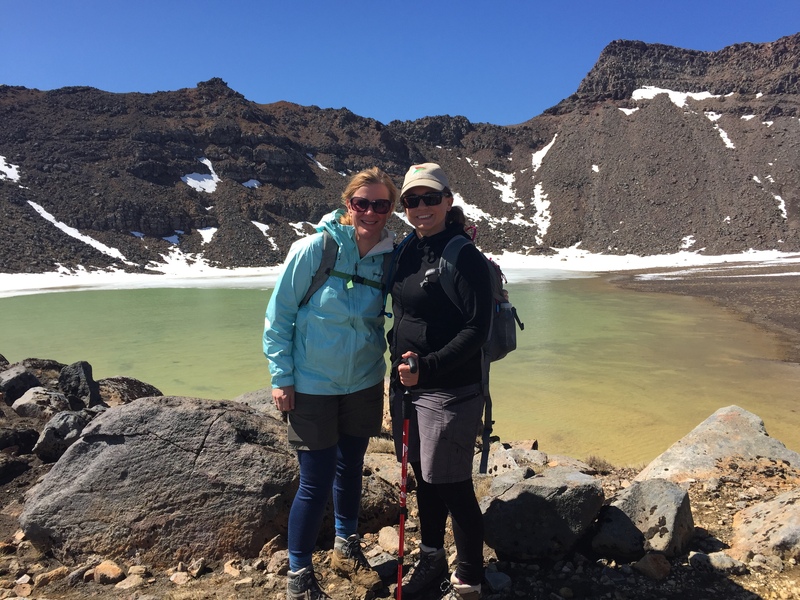 The Tongariro Alpine Crossing is known as one of New Zealand’s best one day walks, and it was on our list as something we had wanted to do, so when our friends Sarah & James invited us to join them for the weekend to do the walk, we eagerly accepted and booked our flights. We flew in to Rotorua and booked a rental car. Flights to Taupo (which was closer to where we wanted to go) were a lot more expensive and the timings didn’t work as well. The other option was to go to Palmerston North and drive in from there. The distance is similar. The drive from Rotorua to National Park is just over two hours. We took the opportunity to stop off for some sightseeing along the way. This area is well known for the geothermal activity. You can smell the sulphur as you fly in, and vents of steam and bubbling mud are dotted about the countryside. We stopped off at Craters of the Moon Geothermal Area near Taupo, and paid $10.00 each to explore. The whole area is really hot and as you walk around the track steamy holes appear along with pools of bubbling mud, which were a little dry. Our next stop was a quick look at Huka Falls and the supermarket to stock up on supplies for the weekend, followed by a beer overlooking the beautiful lake Taupo. Sarah had booked us a fantastic holiday house just out of National Park village. This new house had a stunning view overlooking the mountains, along with four double bedrooms and a bunk room. Plenty of room for a group of friends to stay. We were joined by Kim & Shane, Emma & Gavin and we cooked up a huge Mexican dinner. The following morning some of the team got up early to head down to the pub to watch the Rugby World Cup semi-final. Thankfully the All Blacks won the tight game, and by the time they arrived back at the house at 6am we had breakfast on the go. The weather was perfect for our big adventure ahead. 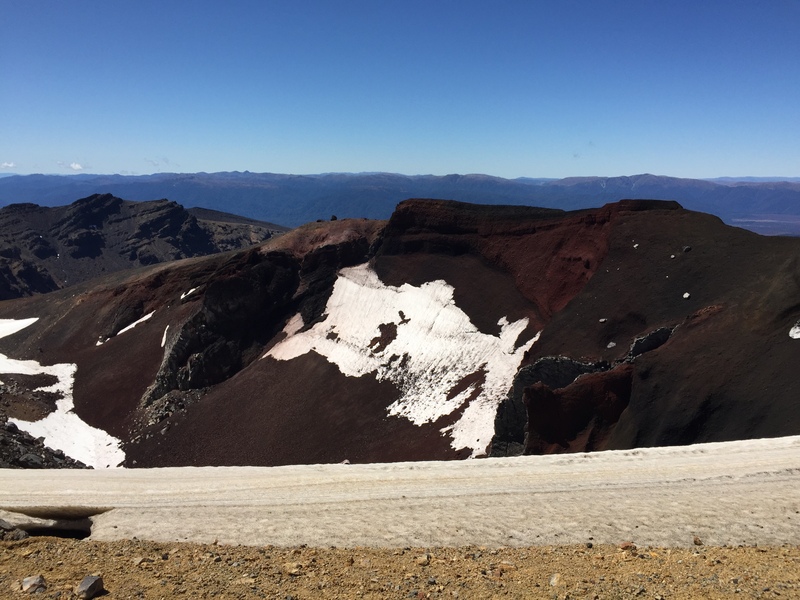 The Tongariro Alpine Crossing is a 19.4km walk from Mangatepopo to Ketetahi Hot Springs. The end of the track is about a 20 minute drive from the start, so we drove two of the cars to the finish, left one car there, and then drove the other car to the start of the track. There are shuttles available if you don’t have the luxury of another car to drop you off. It really is best to start the track at Mangatepopo. There were only a handful of people walking in the opposite direction. Mangatepopo is at a higher altitude than the end of the track. People starting in the opposite direction had a very long hard haul up a steep hill to get anywhere. We were glad we started early, as even at 8am, the car park was filling up. Bus load after bus load of people were being dropped off and a huge queue of people formed at the long drop toilets at the start of the track. For someone who is used to hiking in relative solitude, this was a huge shock for me. Apparently 65,000 people walk this track every year. It felt like about 95% of people walking were tourists. Where are all the New Zealanders enjoying our beautiful country?! The track starts easily ambling through scrubby bush and up to Mangatepopo hut after a couple of kilometres. From there it is a slight climb alongside a babbling stream until Mt Ngauruhoe looms high overhead, rising up from a volcanic ash rock strewn flat. Being October, there was still some snow on the top of the mountain, and we could see a wisp of smoke/steam escaping from the crater at the top. The walk had been really enjoyable and easy so far. The sun was out, and I made the first of many clothing combination changes, stripping off my thermal and jersey and replacing it with just a T shirt. We seemed to have walked our way in to a basin, I was wondering where the track might go to next when I noticed what looked like a procession of ants, half way up the mountain. Question answered, we began the steady climb up lots of steps and along the track following the procession of other hikers. Lungs screaming, I was pleased I had done some hill training for this walk, but was wishing I had done a lot more! 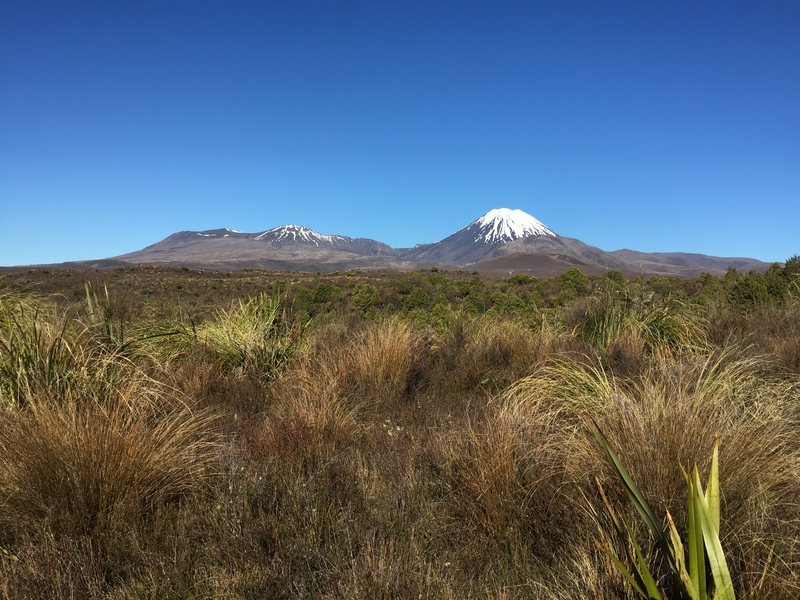 We eventually made it to the saddle and were rewarded with a stunning view back towards Mt Taranaki to the West and the South Crater out the other side. I stuffed some more of Andrew’s home made scroggin in my mouth along with one of the ham rolls, and made another clothing change, adding the jersey and jacket to break the cold wind that was blowing through the pass. Way in the distance half way up Mt Ngauruhoe we could see more hikers heading to the top. The supposed three hour round trip to the top looked very steep. We carried on and walked across the huge South Crater. There was still some snow on the ground and a half frozen yellowy green lake was thawing. After the South Crater, there was a steep walk up a ridge to the Red Crater. Despite it still being a stunning day a cold wind had picked up and was tearing across the ridge. It was a real scramble to get up the hill and at one stage I lost my footing, and my nerve, and proceeded the rest of the way with much caution. At one point there was a chain to help pull yourself up a particularly steep section. I thought it was particularly challenging and wondered what all the tourists must be thinking they had got themselves in for! Eventually we made it to the Red Crater. This was our highest point 1886m. It was a steep descent from here on loose scree. I was pleased I had bought a hiking pole as there were lots of people slipping over. I found that if you dug your heels in and just kind of slid down the mountain it was easier. The view made the descent even harder as it was impossible to take your eyes off the stunning emerald lakes! There was a strong smell of sulphur and steaming rocks around the side of the lakes, which presumably helps give them their unique stunning colour. All the hard effort to get to this point was made so worthwhile seeing this view. After another break taking lots of photos we carried on across another crater, through some snow and up to the Blue Lake. I was pleased that I was wearing my decent tramping boots, but there were plenty of people walking in sneakers, including a group of Irish girls who looked like they were heading down to the mall as opposed to undertaking this strenuous hike! We crossed another saddle and then had an incredible vista overlooking Lake Taupo in the distance. We really were so lucky with the weather. Not a cloud in the sky. As we descended the terrain changed again to low scrub and the temperature rose again requiring yet another clothing combination change. The track sidled along the hillside and reminded me of a track from a book from my childhood called “Mrs Tiggywinkle”. Another volcanic vent was steaming away in the distance. This one erupted a year or so ago requiring evacuation of the hikers and the closure of the track for some time. The initial relief to finally be going downhill soon wore off as the steep track snaked its way 9km down the hill. My knees soon began to ache and I was thankful for the tip of cutting my toenails before the walk. Popping some Nurofen took the edge off the pain a little. This part of the track felt like it went on and on. We passed a few people heading up. They had done it the hard way round and it was already early afternoon. I wondered if they had any idea of what was still ahead. The end of the track wove its way through lush bush, sheltering us from the hot sun, and finally after eight hours of walking we made it to the car park where our friends were waiting with the beers we had packed at 7am that morning. You need to be fit! I had been training by walking up the hill behind my house for a few weeks beforehand. I wish I had been fitter. 19.4km is a long way, especially when you are climbing up and down a mountain. Wear decent comfy shoes. I love my hiking boots and had pre-taped my feet to prevent blisters. Cut your toenails – the downhill part of the track is relentless. Hiking poles are handy, particularly in the scree slidey parts. Check the weather – we had a perfect day, but it was still really cold and windy at the top. Pack a cap, sunscreen and sunglasses, there is very little shelter from the sun. I had a T shirt, thermal top, woollen icebreaker jersey and water/wind proof jacket and wore all of them in various combinations. I had shorts and thermal leggings on my legs. Arrive early to get a good parking spot. Drop a car at the end of the track. There are shuttles available to transfer you. There are also only a few toilets. Take your camera – the scenery is just spectacular. The following day we were all very stiff, and hobbling around. 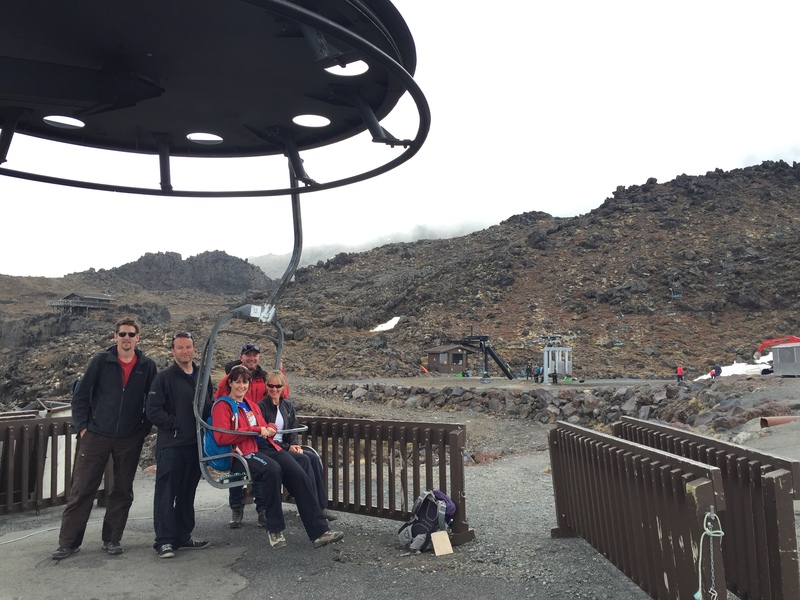 Sarah was keen to go skiing at Whakapapa. It was their last day for the season, so we packed up the car and headed up the mountain for a look. The access road is amazing compared to our South Island ski fields. Two lanes and sealed all the way up! Sadly there wasn’t much snow, and the clouds were closing in. I wasn’t convinced that my legs would actually be able to work the skis – I was having trouble walking! So we pulled the pin and went for a look around the amazing Tongariro Visitors Centre instead and then on to some hot pools in Tokaanu. 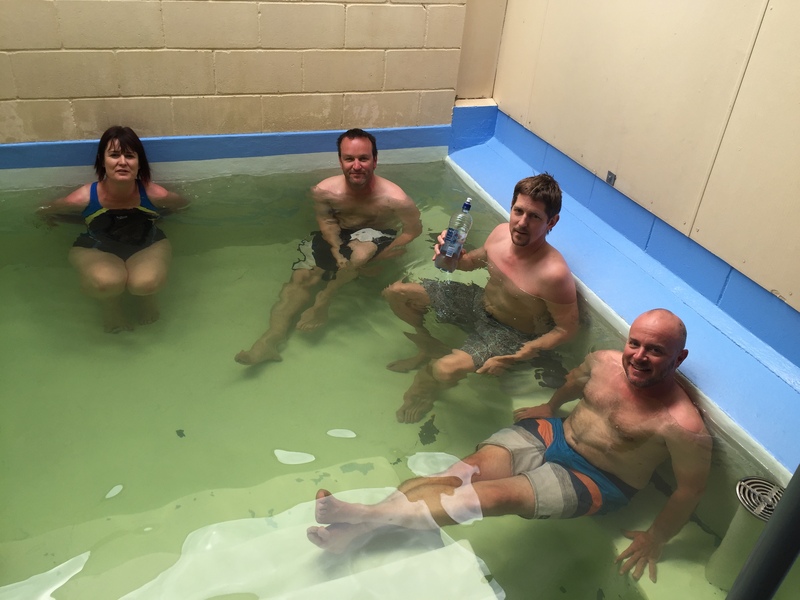 For $10.00 we had a soak in some very hot thermal water which we hoped would ease our sore muscles. Then we headed back to the Chateau for lunch. This fabulous grand building was opened in the 1920’s and was very opulently decorated. A doorman opened the door for us, and we had lunch in front of one of the roaring fires. Sadly, all long weekends must come to an end. We had taken another day off and it was time to head home. We cleaned up the house and then hit the road. Keen to see some more bubbling mud, we stopped off to have a quick look at one of the signposted places along the way. Sadly they were charging a $33 per person entry fee, and as we only had a limited amount of time, we decided to give it a miss. I had caught a glimpse of a small sign indicating a mud pool further along the road, so we carried on and eventually came upon some free mud! We sat and watched as it blooped away making the most amazing bubbling mud sound and ate our leftovers that we had packed as lunch. Then it was back to the airport and home again. Another fantastic adventure. Awesome pictures! Looks like a great hike. It is amazing. Perhaps a victim of its own popularity being that there were so many other people which I didn’t enjoy so much. Apparently it is only New Zealanders that complain about the crowds. The other nationalities don’t seem to notice. Great pictures! My legs hurt so much the next day – I certainly wasn’t as fit as I should have been before we tackled the crossing. I think I would have enjoyed it a lot more had I been able to walk up the hill without gasping for oxygen! But ironically it was the downhill bit that was the most painful! It is a beautiful spot. Hope you got good weather on your trip Ellen. I’m sore all over just from reading about the day hike, much less attempting it. But the adventure sounds fantastic, and the pictures truly are wonderful. Thanks Mike, my legs are only just coming right today – day 3. Hard work but worth the effort. I so wish I’d made the time to do the walk last summer when I was there. Not sure I’d have been fit enough though after reading your account. It’ s still on my bucket list! I guess I’ll have to get fit and return to NZ once again…they say third time’s the charm! Loved your adventure and your pictures, Viki. Highlight of my trip, I did it with guides 14th October, still buzzing from it. Plenty of snow then. I’m 50 & proud I kept in the middle of our group. Couldn’t believe it when I saw people in sneakers & jeans. Some parts where nearly knee deep in snow. Thanks for your beautifully written and accurate description.